Manager Tony Pulis has left Crystal Palace by mutual consent less than 48 hours before the start of the season. The 56-year-old met chairman Steve Parish on Thursday as tension between the pair came to a head. The former Stoke boss, who won the Premier League's manager of the year award last season, had been frustrated by the failure to land a number of summer transfer targets. Assistant manager Keith Millen will be in charge against Arsenal on Saturday. On Friday, Palace issued a statement, saying: "The club would like to thank Tony for his efforts with the club last season and wish him all the best for the future." Bookmakers' odds had tumbled on Thursday as speculation over the Welshman's job intensified. Malky Mackay and David Moyes were suggested as potential candidates to replace Pulis by former Palace defender Matt Lawrence, speaking on BBC Radio 5 Live. The remainder of Pulis's coaching staff - including Gerry Francis and Dave Kemp - have been asked by Parish to stay on for the trip to Arsenal before leaving the club. Gunners boss Arsene Wenger said: "He has done a remarkable job last season, made a miracle. I was at a managers' meeting on Monday, he was there and nothing indicated he wouldn't be here tomorrow." Pulis wanted to assume greater control of all football matters at Selhurst Park, especially transfers, after missing out on a number of key targets. He and Parish also disagreed about their vision for the club. "The Premier League soap opera has begun before the opening titles. I was with Tony at the Community Shield - there was no particular indication then or through the summer that he would not be manager at the start of the season. I know he felt this was just the start for Crystal Palace, they needed to retain their status in the Premier League for at least three years in order to realise the club's full potential. "He felt the club needed a complete upgrade off the pitch. It's no secret that there was this creative tension between him and Steve Parish. His stock is so high, he won't be short of offers at some point in the near future." Parish and sporting director Iain Moody are in charge of delivering the potential signings earmarked by Pulis. Moody arrived in November from Cardiff City, where he had held a similar role before being dismissed by the owner Vincent Tan. Palace signed Liverpool full-back Martin Kelly on Thursday, while striker Fraizer Campbell arrived from Cardiff for £900,000 and former Fulham centre-back Brede Hangeland have joined on a free. Just hours before Pulis left, Kelly told the club's official website: "I'm looking forward to playing under Tony and playing regular football again." Hangeland also picked out Pulis as one of his reasons for moving to Selhurst Park, saying: "All the things I've heard about this club - the manager, players, staff - it's all been good." Pulis left Stoke last year after seven years at the Britannia Stadium, having guided the Potteries outfit to the Premier League and kept them there, extending his record of never being relegated. Palace were bottom of the table when he was named as Ian Holloway's replacement in November 2013. Biggest win: 3-0, at Cardiff, April 2014. Biggest defeat: 3-0, at Newcastle, December 2013. 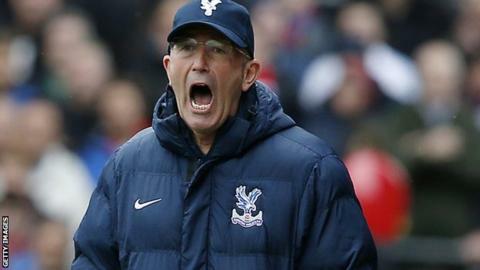 Pulis managed to halt the decline, and a run of five successive victories from 29 March, starting with a 1-0 win over Chelsea, steered the Eagles to safety. They famously came back from three goals down in the final 11 minutes against Liverpool to all but deny the Reds the title at the end of last season. Their eventual 11th-placed finish was the club's highest since 1992. Former Palace chairman Simon Jordan told Talksport that managers "have to do as they're told". "Football managers are incredibly difficult people to deal with because they believe their own hype," Jordan said. "I know what managers will do, they will put you to the sword. If you don't stand up and you don't manage your football club properly, they will run havoc in it and then they will disappear into the ether when it least suits you." Pulis's transfer spend since joining Palace is approximately £10.5m - including January signings Scott Dann, Jason Puncheon and Wayne Hennessey, who arrived in a £3m deal from Wolves, and loan deals for Tom Ince and Joe Ledley. At the end of last season, Parish spoke to the South London Press about Pulis, saying: "He took a big chance coming to Crystal Palace on a verbal promise that I and the club would support him financially." After steering Palace to safety, Pulis said: "In the first couple of weeks Steve and I had our moments but the longer the season has gone on the closer we've got. "Our relationship, which I think is the most important at a football club, has got more and more solid." Hull defender Curtis Davies tweeted: "Can't believe Pulis has walked. Done a great job in his short time at Palace. Who do you think will replace him? Malky Mackay a good shout?"